The song's called what again? Chinese Democracy, the title track from the upcoming Guns N' Roses' album, hit US radio outlets today (22 October) as a download at 5 am. Which means one thing: free Dr Pepper is on the way! The album Chinese Democracy is due - yes, it looks like it's really true - 23 November exclusively at Best Buy outlets in the US. The 14-track set includes only three songs that have not either been performed live or leaked online in recent years. Okay then. Surely, you must be itching to hear this sucker, right? Well, here you go. 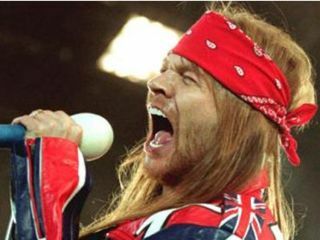 Listen to the song Chinese Democracy right here. Hmmm, nice cowbell. Think Will Ferrell had anything to do with it?